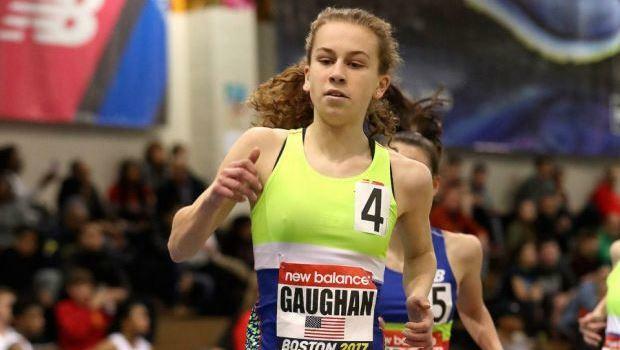 Jackie Gaughan of Exeter (NH) won last year's Junior Mile. Gaughan is among the field on Saturday. One of the featured track & field meets of the indoor season will be held this Saturday when some of the world's top athletes will make their way to the Reggie Lewis Track and Athletic Center for the 23rd annual New Balance Indoor Grand Prix. In its long history, the event that has produced nine World Records and 13 American Records. Certainly another highlight of the nearly three-hour meet, which will be partially televised on NBC Sports Network, is the high school events, including the Junior Mile. As always, meet officials have assembled a stellar field for this weekend's race. No question, the meet records could go down on both the boys' and girls' side. In this article, we feature the 12 girls that will be toeing the line on Saturday for the 5:32 p.m., start.